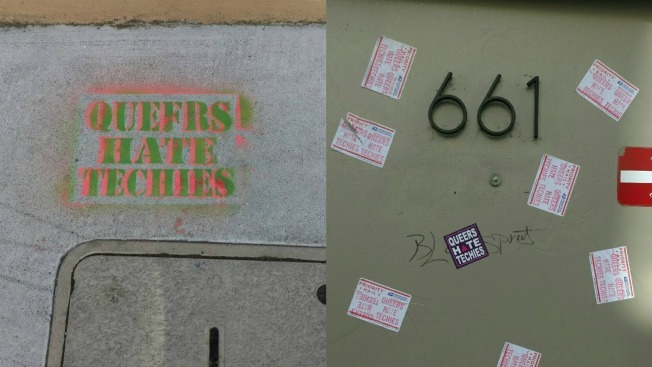 A political organization in San Francisco was vandalized with hateful graffiti and stickers (Oct. 23, 2016). A San Francisco-based political organization is searching for answers after someone spray-painted "Queers Hate Techies" on the sidewalk outside the company's headquarters last week. The YIMBY Party, which fights for housing reform in the Bay Area, said that stickers with the same wording were plastered on the their building's front door along and knife engravings were etched on the entrance as well. YIMBY Party co-founder Laura Clark said she is deeply troubled by the act of vandalism. "Many members of the tech community are queer, do not make six figures, and are struggling with housing," she said in a press release. "YIMBY is fighting for diverse, integrated neighborhoods by increasing housing opportunities for everyone. Pitting tech against the queer community, when everyone needs housing, turns us against each other." An activist and founder of East Bay Forward, a chapter of the YIMBY Party, was also not afraid to mince words. "This graffiti minimizes the blood, sweat and tears we queers in tech have put into assailing the systemic roadblocks to inclusion," Victoria Fierce said in a press release. "It perpetuates the bigotry that tech is hostile to queers and only serves to make our work harder. I am a queer in tech and this does not represent me, my friends, or the queers in tech community." Clark said that the YIMBY Party has cleaned up the graffiti on its property, but added that nearby buildings were also vandalized.